A lung biopsy involves a procedure where samples of the lung tissues is removed (using a special biopsy needle or throughout the surgical procedure) in order to distinguish whether the lung disease is current. A lung biopsy may involve a closed or open process. The operation includes a chest x-ray or chest CT scan to locate the precise area of the biopsy. When a biopsy is completed using the CT scan procedure, you might be lying down throughout the entire exam. 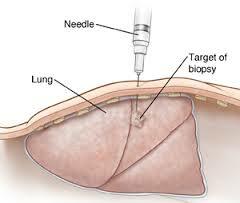 A needle biopsy of the lung could also be used throughout a bronchoscopy or mediastinoscopy. You would be required to sit with your arms still on a table. Strive not to cough throughout the biopsy. The physician will tell you to take your breath in. Your skin area will be cleansed so that an anesthetic medication could be injected. The doctor will create a small cut in the skin, and will begin to insert the biopsy needle into the lung tissue. A tiny piece of tissue is taking out by the use of a needle and is then sent to the laboratory for studying. Once the biopsy is accomplished, pressure is used on to the site. When the bleeding has cease, a bandage is placed in the area. A chest x ray will follow after the biopsy. The procedure takes 30 minutes to 1 hour. A laboratory examination typically takes a few days.